When deciding what guests should toss at you during your recessional, consider your options. Rice is traditional and bubbles are popular, but Megan Wellman and Rob Roedts decided to go a different route at their September 4, 2010, wedding at the Balch Hotel, often called the sunniest spot in the Columbia River Gorge. “Rob is an aerospace engineer, so I wanted to incorporate his love of airplanes into the wedding somehow,” says Megan. “Also, for the first nine months of our relationship we were long distance. 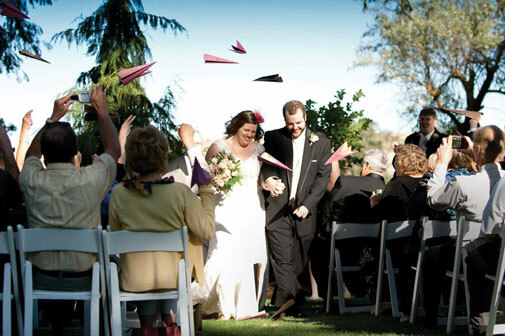 There were a lot of airplane flights during those first months.” So the lovebirds asked guests to launch magenta and tan paper planes made from heavy weight craft paper into the air as they exited their ceremony. A strong wind helped the crisp planes soar and send the new couple on their way.